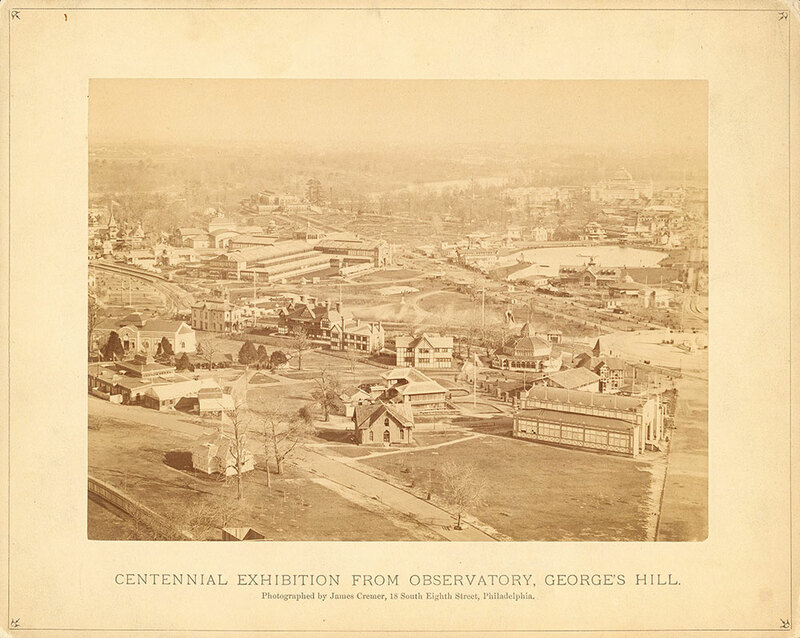 Notes: Aerial view of exhibition grounds with buildings, roads, and railroad tracks visible. Notes: Architects: George's Hill Restaurant -- H.J. Schwarzmann & Hugh Kafka; Hungarian Wine Pavilion -- H.J. Schwarzmann; New York State Building -- Croff & Camp; U.S. Government Building -- James H. Windrim; Women's Pavilion -- H.J. Schwarzmann; New Jersey State Building -- Carl Pfeiffer; Horticultural Hall -- H.J. Schwarzmann; Centennial Photographic Association Building -- H.J. Schwarzmann & Hugh Kafka; Japanese Dwelling -- Matsuo-Ehe; British Government Buildings -- Thomas Harris. Notes: Architects: Pennsylvania State Building -- H.J. Schwarzmann & Hugh Kafka; World's Ticket Office -- H.J. Schwarzmann; Spanish Exhibition Building -- Alexander B. Barry; Memorial Hall/Art Gallery -- H.J. Schwarzmann; Vermont State Building -- Lamos; Turkish Cafe -- Pierre Montani; Judge's Hall -- H.J. Schwarzmann & Hugh Kafka; Pennsylvania Railroad Office -- J.M. Wilson. Notes: Exhibit titles: George's Hill Restaurant, Bldg. #90; Hungarian Wine Pavilion, Bldg. #55.5 [sic]; Centennial Police Station, Bldg. #174; Pacific Coast Hall/California State Building, Bldg. #94; New York State Building, Bldg. #74; Missouri State Building, Bldg. #70; Massachusetts State Building, Bldg. #63; New Hampshire State Building, Bldg. #61; U.S. Government Building, Bldg. #51; Women's Pavilion, Bldg. #153; United States Army Post Hospital, Bldg. #52; New Jersey State Building, Bldg. #155; Agricultural Hall, Bldg. #152. Notes: Exhibit titles: Pennsylvania State Building, Bldg. #55; West Virginia State Building, Bldg. #68; Japanese Dwelling, Bldg. #67; British Government Buildings, Bldg. #71, 72, & 73; Cigar Stands, Bldg. #77; Arkansas State Building, Bldg. #66; World's Ticket Office, Cook, Son & Jenkins, Bldg. #84; Spanish Exhibition Building,Bldg. #86.5 [sic]; Mississippi State Building, Bldg. #89; Frank Leslie's Pavilion, Bldg. #97; Turkish Cafe, Bldg. #96; Vermont State Building, Bldg. #100; Centennial Photographic Association Building, Bldg. #110; Horticultural Hall, Bldg. #151; Memorial Hall/Art Gallery, Bldg. #101.